It’s nearly Halloween and what better way to celebrate than to have an enormous skull shaped rock whizz past Earth at an alarming speed? Yes fellow Earthlings. The comet known as ‘The Great Pumpkin’ is making a spooky return just after All Hallows Eve; having last made an appearance on 31 October 2015. Seriously, this guy knows how to make an entrance. 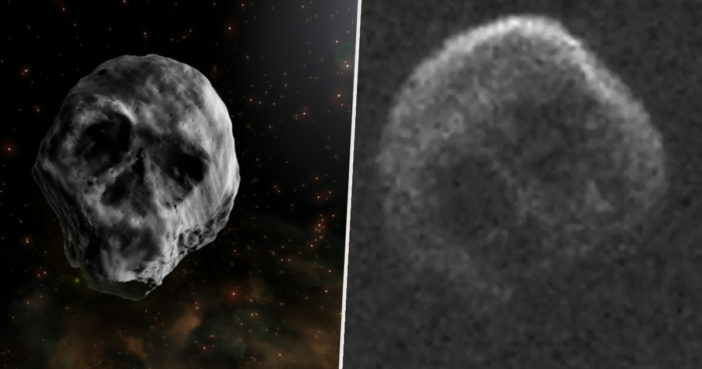 Officially named ‘Asteroid 2015 TB145’, this creepy as fudge comet bears a striking resemblance to a human skull – from a certain angle – complete with hollow eye sockets, nostrils and enviable cheekbones. And it doesn’t just look like a gigantic zombie, it actually kind of is. Mega goth Asteroid 2015 TB145 is known as a ‘dead comet’; having lost the majority of its ice and gases after many orbits around the murderous sun. First discovered by the University of Hawaii’s Pan-STARRS-1 (Panoramic Survey Telescope and Rapid Response System) telescope October 10, 2015, the diameter of this so-called ‘Halloween Asteroid’ is thought to measure between 2,050 feet (624.84 meters) and 2,297 feet (700.13 meters). The IRTF data may indicate that the object might be a dead comet, but in the Arecibo images it appears to have donned a skull costume for its Halloween flyby. Sadly, we won’t be able to get as much of a good look at its grinning face this time around. Back in 2015, the eerie comet brushed past Earth by a mere 300,000 miles and could be seen with the aid of a decent telescope. This time, it’ll be 25 million miles away at the very closest; meaning you won’t be able to get a good look at its Voldermort-esque visage. This may come as good or bad news, depending on how creepy you are. This time it’s not coming close enough [to Earth] to be any larger than a dot of light. Ever the maverick, Asteroid 2015 TB145 won’t be at its closest until way after your light-up devil horns are shoved back into the wardrobe; November 11 to be precise. You’d have thought it would at least have the manners to bob on a humungous Santa hat at such a late stage. Despite its relative tardiness and reclusiveness, space watchers are still looking forward to greeting The Great Pumpkin once more; appreciative of its bold heavy metal vibe. It’s probably a massive skull from a planet of giants which was destroyed, Millenia ago. It’s a sign of good fortune for goths. If someone doesn’t make a band called ‘Skull Shaped Death Comet’ artistic genius is dead. After 2018, the comet is not predicted to grace us with its presence for another 70 years, when it’s anticipated to come within 5.4 million miles of Earth. Welcome back spooky old friend, and bravo. Your all-out costume may well have won Halloween 2018, even if you’ll be arriving a little late to the party.